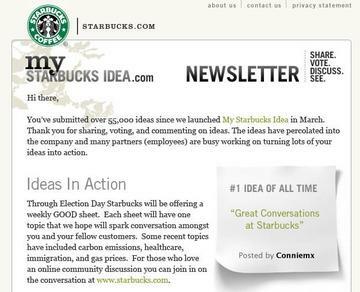 Just got an email from Starbuck's directed to the folks (like myself) who submitted over 55,000 ideas to the MyStarbucksIdea.com website. The crux of the message is that Starbucks is being responsive to the ideas generated during the campaign. This is important, as "responsiveness" is one of the six drivers of credibility in my book "Satisfied Customers Tell Three Friends, Angry Customers Tell Three Thousand." So which idea got the most votes? Turns out, the big winner was one for Starbucks to, drumroll please..."create a sense of conversation and community within its locations." One way of doing this would be to use the power of media and wireless new media in particular to foster a sense of conversation about the arts, current events, etc. In other words to stimulate Starbucks patrons that wish to interact as part of a 21st century "cafe society" such as they have in Europe traditionally - people gathering together to discuss the arts, world events and culture.